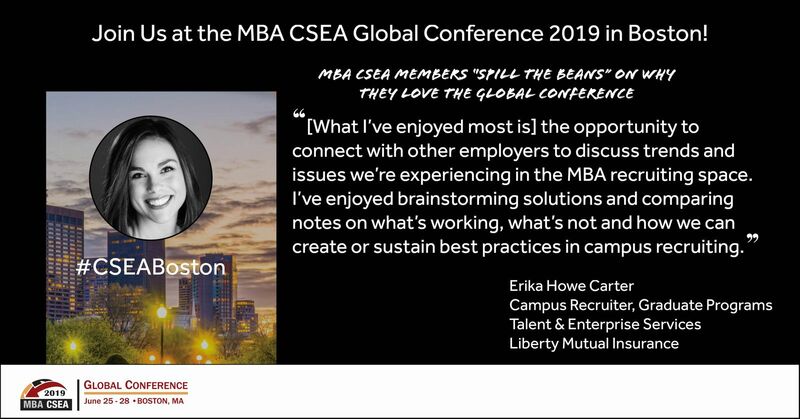 Connect with other MBA/Masters level employers to share best practices, discuss common challenges and develop solutions. Develop new relationships with school partners and enhance existing ones. Join the conversation about the best way to ensure the right employment fit for graduate business students. Enhance your own personal and professional development with programming created by and for employers. In Beantown (Boston’s nickname), we will have the unique liberty to Spill the Beans instead of holding back! We will kick off the conference programming with these sessions, which allow conference attendees who share similar roles at their university or company to engage in energetic activities – connecting, asking questions, and sharing ideas and information with like-minded colleagues. Due to positive feedback from last year, follow-up sessions will be offered again this year to continue the discussions on Thursday afternoon. Join this discussion session for an in-depth look at the results of the recently-released 2019 GMAC Corporate Recruiters Survey. We will discuss the hiring outlook, including salary projections, employer demand for non-MBA business master’s students, and international students. We will share information about shifts in business school demand, as reported from prospective students and admissions departments. We invite employers and school professionals to join this year’s discussion to share what your programs are doing to assist students in their job search. Learn how to create a new expression of your talent brand that aligns with who you are and who you inspire to be as a company.Come learn how to improve authenticity by creating more consistency between the internal and external experiences to build a stronger connection with perspective talent.